Source: National Center for Education Statistics, National Assessment of Educational Progress 2013. Chart: Strategies for Children. ©Strategies for Children. All rights reserved. 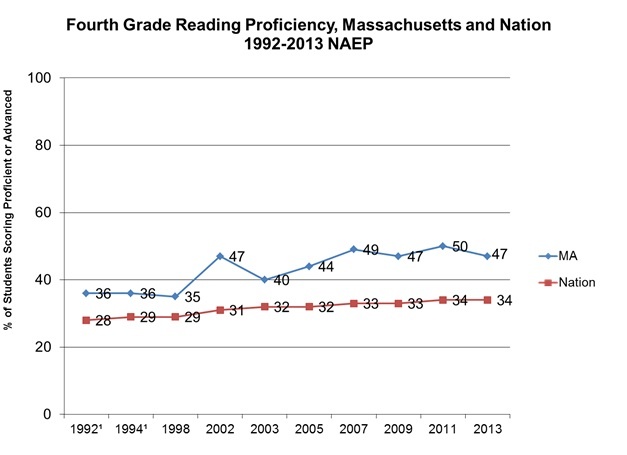 There is an unfortunate hidden story in the release of yesterday’s National Assessment of Educational Progress (NAEP) 4th grade reading scores in Massachusetts. A startling 53% of children scored below proficient in fourth grade reading. Research shows that a significant portion of these children will continue to struggle in school. While Massachusetts is recognized for its national test scores, too many children begin school already behind – and too many will never catch up. Simply being better than other states isn’t enough when significant achievement gaps exist and thousands of children lag behind. This achievement gap is evident long before children enter school, and we will not succeed in closing it unless we target resources to early learning, high-quality pre-k and early literacy. Last week, the Early Literacy Expert Panel held its first meeting. The panel’s goal is to help close the achievement gap in reading and ensure all students are proficient readers by the end of third grade. The panel was created through An Act Relative to Third Grade Reading Proficiency — legislation which was passed last year with significant bipartisan legislative support and signed into law by Governor Patrick. We cannot continue to leave children behind and hope they will catch up. We must make the investments needed in the early learning years to ensure children have the start they need to succeed in school.